Giovanni Martino and his assistant work on the mural. Gilroy has been long-recognized for its garlic, but South Valley’s winemakers are equally deserving of recognition. A large mural was recently unveiled on the north side of the downtown CMAP TV building to commemorates the local wine industry. The mural features a charming vineyard scene, complete with a farmhouse, vintage truck, prop plane, grapes, vines, and wine bottles. It also includes a map of the area’s wineries so visitors can make notes and plan their own wine trail excursion. The names of wineries and other sponsors are displayed on wine barrels painted into the mural to complete the image. The Wineries of Santa Clara Valley association supported the idea with 22 members paying the fee to be included on various parts of the mural. Different fees applied depending on which spot was chosen. Giovanni Martino prepares paints for application. Communicating the vision wasn’t easy to explain until there were renderings. “We’d show them everywhere and take any chance we had to talk it up,” Turner said. It also reflects the strong partnership between the wineries and the city of Gilroy, she said. “It shows how we continue to work together to draw new visitors to the area,” she said. Visitors who think the artwork has a familiar look won’t be surprised to know that it’s a creation of the same artist who painted “Garlic City,” the garlic-themed mural overlooking a Fifth Street parking lot 25 years ago. 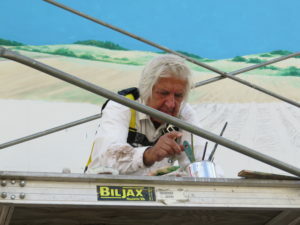 Gianni Martino of Torino, Italy, was doing some touch-up work on the garlic mural about five years ago when the Chamber approached him about the possibility of doing a mural on the other side of the building. .
“The chamber board was interested in making sure there was congruency between the two murals,” Turner said. Martino was the perfect choice. Murals within urban settings can be impactful, he said. For one thing, they become landmarks. 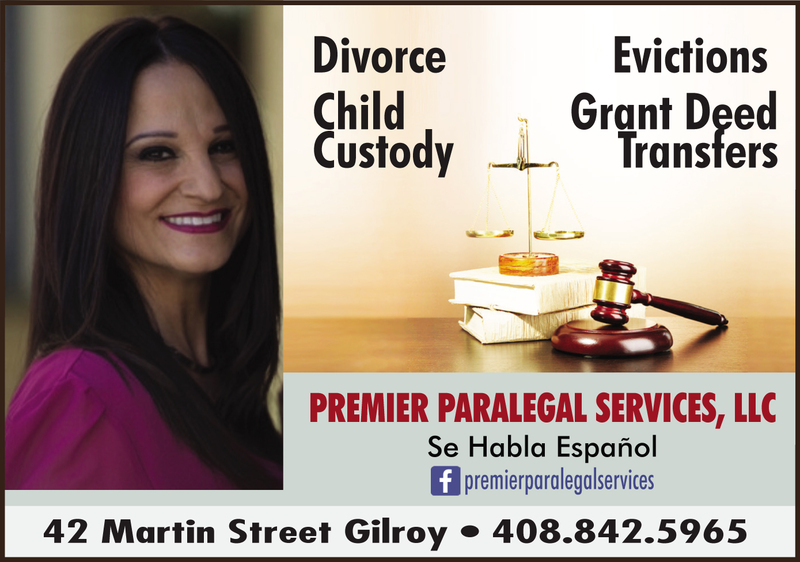 A group of friends or business associates may not be familiar with a certain area. But surely, they can find a mural to serve as a gathering place. Public art also creates a sense of identity within a community. 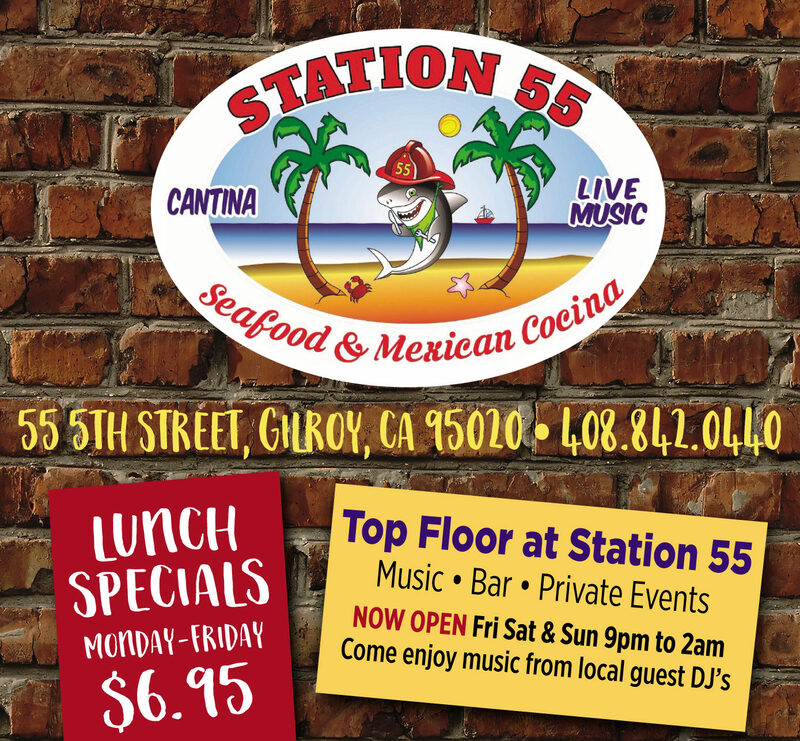 It can increase foot traffic, leading to higher revenue for surrounding shops, restaurants, and other businesses. The mural also adds vibrant color, and breaks up the monotony of concrete and bricks that blur together in urban settings. Public murals also afford a cost-free opportunity to view art for those who may not otherwise have the opportunity. Since it was finished, people visiting downtown Gilroy take selfies of Martino’s garlic mural-themed as a keepsake. It has also been featured online and in publications around the world. Visitors can now snap a photo of the winery map and go find these wineries, she said. The winery association has 31 members, so the 22 members who participated make up about a 70 percent participation rate, Seeker said. 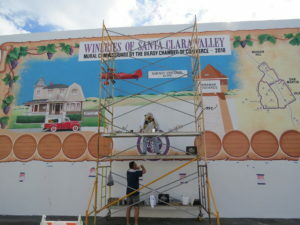 The wineries featured in the mural include: Alar Cellars, Avery Family Vineyard, Church Creek Cellars, Clos La Chance, Creekview Vineyard, Dorcich Family Vineyards, Fernwood Cellars, Fortino Winery, Guglielmo Winery, Hecker Pass Winery, Heller Vineyard and Wines, Jason-Stephens Winery, Lion Ranch Winery, Martin Ranch Winery, Medeiros Family Wines, Miramar Vineyards, Morgan Hill Cellars, Sarah’s Vineyard, Satori Cellars, Seeker Vineyards, Solis Winery, and Stefania Wine LLC. As Torino began work on the mural, people passing by took an interest and started inquiring about sponsorship opportunities for their Gilroy businesses. Additional sponsors include: Accurate Printing & Promotions, Action Gypsum Supply West, Bryan Bins, Inc., Creative Labels, Danny & Nita Mitchell, Dora Fortino, Epic Painting, Gilroy Downtown Business Association, Gilroy Self Storage Depot, Gilroy Welcome Center, Gina Lopez — State Farm, Integrated Financial Benefit Services, Jose Montes, Joyce Duarte, Larry Connell, Lisa Faria — Coldwell Banker, Premier Paralegal Services, Mayor Roland Velasco, Merrill Gardens, Michelle Campbell Insurance, Northern California Plasterers’ Apprenticeship Local 300, Oliveira Plastering, Rivers del Rey, Starritt Realty, and Vivan Investment Partners.